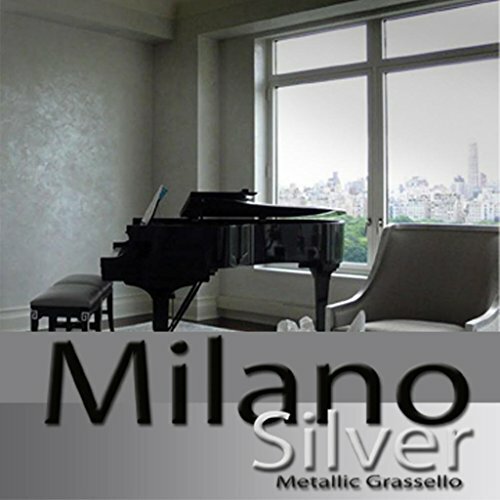 Milano Silver Metallic (Fine) Authentic Venetian Metallic Plaster from Italy. The ultimate in luxury finishes. Milano Metallic plasters are the ultimate in luxury metallic venetian plasters. This natural Italian lime plaster is made from a mixture of grinded minerals that include metallic mica flakes along with lime, marble and other minerals as well as organic binders and resins. This product is developed to meet the needs for modern finishes. These metallics are sold ready to be used. The finish is a soft brushed metal finish that is opaque. The granular size of these particles range from 50-100 (microns) and as a result will provide a smooth satin finishe. When used on interiors surfaces Milano Metallics can easily be used as the final finish, over Grassello or Marmorino, and can also be used as a standalone plaster. The base of this product is aged hydrated magnesium quality slacked lime. You can use as is, or tint to shift the metallic colors. Designed for smooth surfaces. We suggest our products are always applied to a surface that has been properly prepared with a primer. FirmoLux suggest using our MicroPrimer. (search FirmoLux MicroPrimer in Amazon) It is often applied in 1-2 or 3 coats for best results. This product once applied will perform and continue to improve over time. We suggest an application of wax or sealer depending on location of plaster. FirmoLux carries a complete line of waxes and sealers for almost any situation. For more information or technical data, please call 941.366.5550 or visit out company website. Color: Product comes in Silver Metallic and we can also tinted to match any color desired. VOC & LEED: 0-VOCs, 1-LEED Point Certified or more depending on other products used with it. Benefits of Product: Like most lime based products, this product will prevent the growth of mold and mildew. Over a period of time, carbonation of the lime with the carbon dioxide from the atmosphere will bring this product back to its natural state which is limestone and marble. Composition: Magnesium quality micro-filtered lime putty, particles of metallic mica flakes, minerals and other natural elements make up the composition of Milano Metallics. Additional organic additives and resins are included to help improve in the technical and application aspect of the product. If you have any questions about this product by FirmoLux, contact us by completing and submitting the form below. If you are looking for a specif part number, please include it with your message.